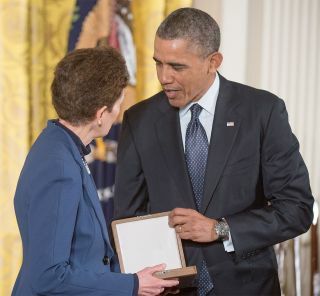 Tam O'Shaughnessy, Sally Ride's life partner and chair of Sally Ride Science, is seen with President Barack Obama accepting the Presidential Medal of Freedom on behalf of Ride, Wednesday, Nov. 20, 2013 at the White House. Sally Ride, the United States' first woman to fly into space, has been posthumously awarded the nation's highest civilian honor, the Presidential Medal of Freedom. In a ceremony held at the White House Wednesday (Nov. 20), President Barack Obama recognized Ride for her role in "keeping America at the forefront of space exploration" and inspiring young girls "to become scientifically literate and to pursue careers in science, technology, engineering and math." "Young girls need to see role models. 'You cannot be what you cannot see.'" Obama added, quoting Ride. "Today our daughters, including Malia and Sasha, can set their sights a little higher because Sally Ride showed them the way." Ride, who made her first of two space shuttle missions in 1983, died July 23, 2012, 17 months after being diagnosed with pancreatic cancer. She was 61. Astronaut Sally Ride, America's first woman in space, has been posthumously awarded the Medal of Freedom. Accepting the Medal of Freedom on her behalf was Tam O'Shaughnessy, Ride's life partner and the chairwoman of Sally Ride Science, the company Ride founded in 2001. "At the end of her life, she became an inspiration for those battling pancreatic cancer and for the lesbian, bisexual, and transgender community," a military aide said, reading the citation for Ride. "The tale of a quiet hero, Sally Ride's story demonstrates that the sky is no limit for those who dream of reaching for the stars." "This year it's just a little more special because this marks the fiftieth anniversary of President Kennedy establishing the award," Obama said at Wednesday's ceremony. In addition to Ride, the President awarded the medal to 15 others, including broadcaster Oprah Winfrey, President Bill Clinton, baseball player Ernie Banks and feminist activist Gloria Steinem. Ride is only the ninth astronaut to be awarded the Medal of Freedom, joining the ranks of Mercury astronaut John Glenn, first moonwalkers Neil Armstrong and Buzz Aldrin, and Apollo 13 commander James Lovell. "Dr. Sally Ride was more than an astronaut — she was an American treasure," NASA Administrator Charles Bolden said in a statement. "There are only a handful of names in the history of human spaceflight that are widely known — and Sally's is certainly one of them."